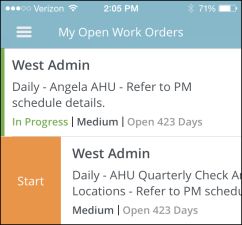 The home screen of the Work Center app is the My Open Work Orders screen. You will see all of your assigned New Request, Work In Progress, and Pending work orders with the most urgent work orders at the top of the list. Swipe a New Request work order to the right to Start a work timer. This marks the work order as In Progress and helps you keep track of your labor hours as you complete the job. To pause the timer at any point, tap on the work order from the list and then tap Pause. 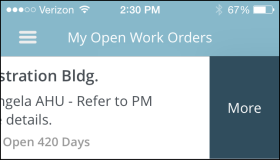 In Progress and Paused work orders will be highlighted when you look at them on the My Open Work Orders list. To Complete an In Progress work order, swipe to the right to enter an Action Taken description and adjust the work timer if necessary. Tap Complete at the bottom of this screen to record the labor hours from the timer and mark the work order Complete. Swipe any work order to the left for More options. From this screen, you can place the work order on hold, decline the work, or mark it as a duplicate request. You can also contact the Requester or Supervisor from this screen. You can also tap on a work order from the list to view more information about it. You will see the same options to start the work timer, complete the work order, and access more options at the bottom of the screen.